Happy Thanksgiving Week! 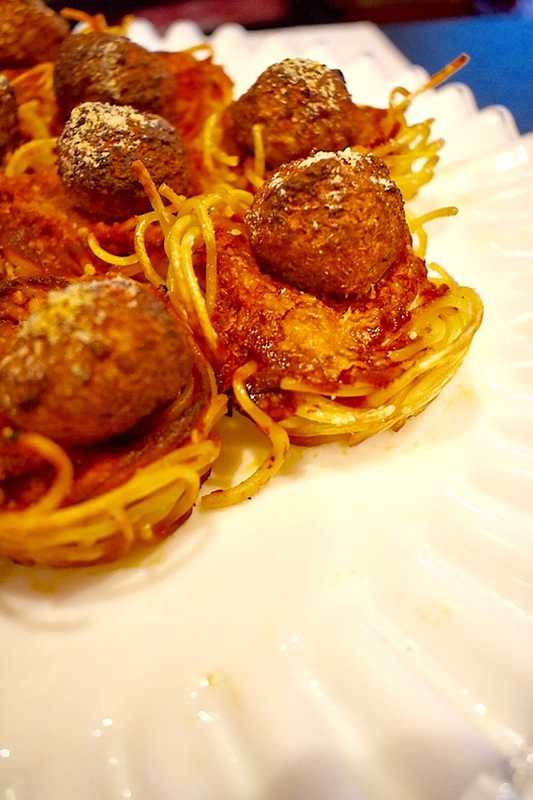 We are trotting right along in our Thanksgiving Appetizer Recipe Series to bring you mamas the cutest version of a pasta dish we have ever had: Spaghetti Nests! These easy to make, fun to eat bites are perfect for the younger guests at your feast and are simply the best portion size for when you’re craving a bit of carbs (because sometimes you just are, I know). One of the best parts of this snack (other than our Organic Garden Pasta Sauce) is the little meatball nestled in the pasta. 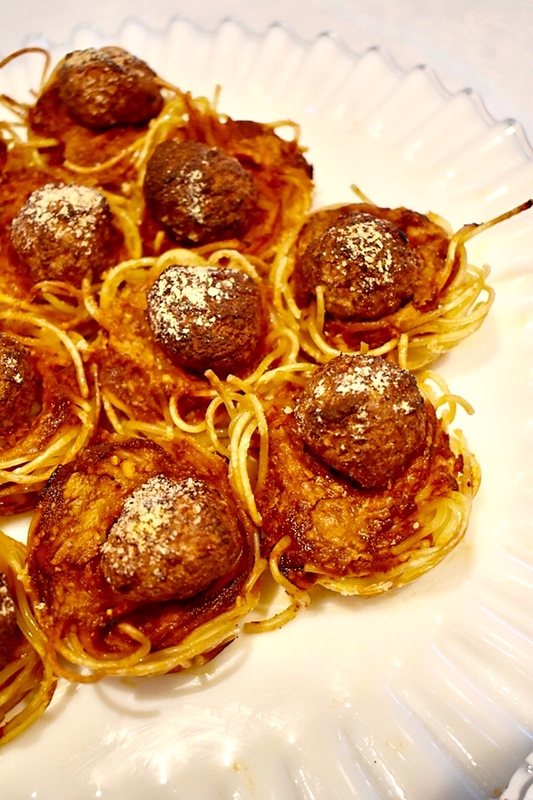 I used frozen organic meatballs for this recipe, but you can always make your own too! The first step is to preheat your oven to cook your meatballs. I put my frozen meatballs in at 375 degrees F for 14 minutes and they came out perfectly, but do whatever your homemade or frozen recipe calls for. While the meatballs are cooking, boil a pot of salted water for the pasta. When it’s at a rolling boil, cook the pasta for about 7-8 minutes, or until desired texture has been reached. Drain the water and toss the pasta with a drizzle of olive oil so the noodles won’t stick together. Let them cool to the touch. Now: let’s build the nest. 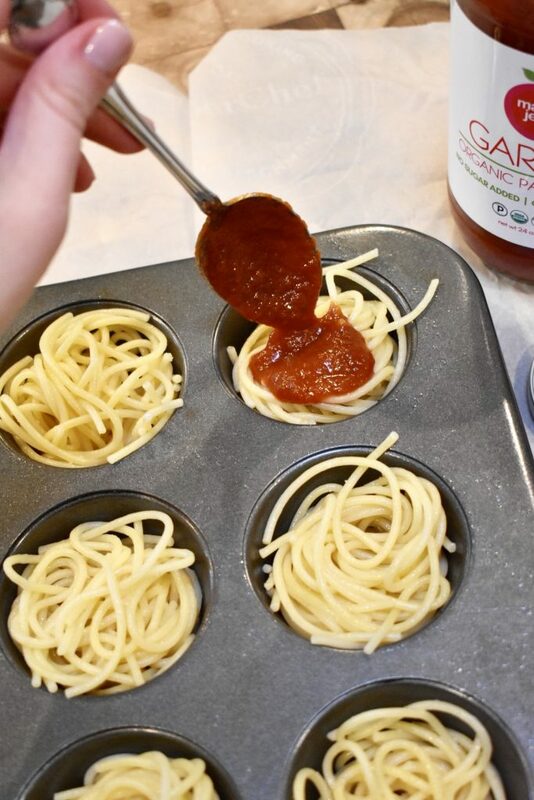 Lightly grease a muffin pan and grab a fork, you’re going to be doing some classic Italian pasta twirling to fit the noodles into each muffin cup. They should fill ¾ of the cup with noodles. 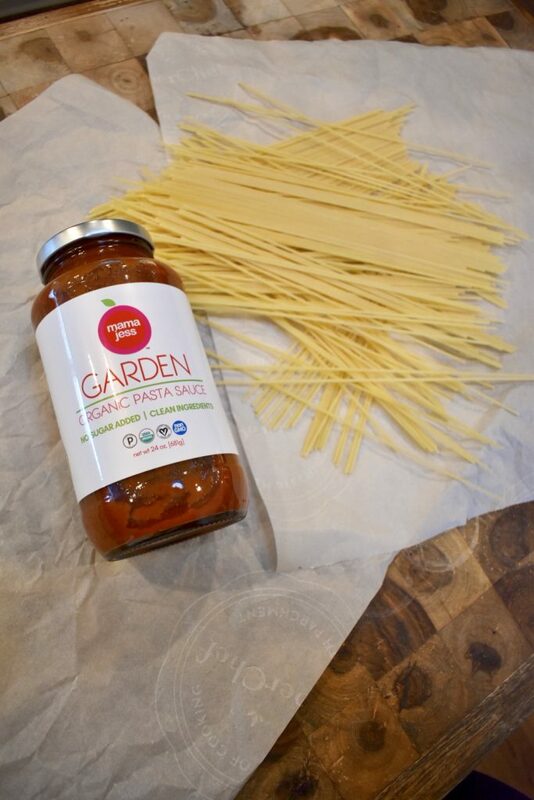 Then, grab your beloved jar of Mama Jess Garden Organic Pasta Sauce and spoon about 1 tbsp on each cup, spreading it out over the top. This way, when the cups bake, the sauce will melt down into the noodles on the bottom. Yum! If you have been reading these blogs, you know I am a Parmesan cheese lover, so I sprinkled a layer on top of the sauce. On top of that? Sprinkle some salt and pepper and a bit of dried or fresh chopped basil. Then nestle a meatball in each little nest, and pop it back into the oven (now at 400 degrees F) for about 15 to 20 minutes. When you take it out, the pasta should be crunchy and formed together in a cup shape. How fun is that? It’s even more fun when everyone tells you how delicious they are! Stay tuned for more recipes coming at you this week! Did you make this dish? Please send us or tag us in a photo on Instagram at @MamaJessFounder! While spaghetti is cooking, cook meatballs according to package instructions. When spaghetti is ready, strain it, and toss with olive oil to prevent from sticking. Let cool for a few minutes. 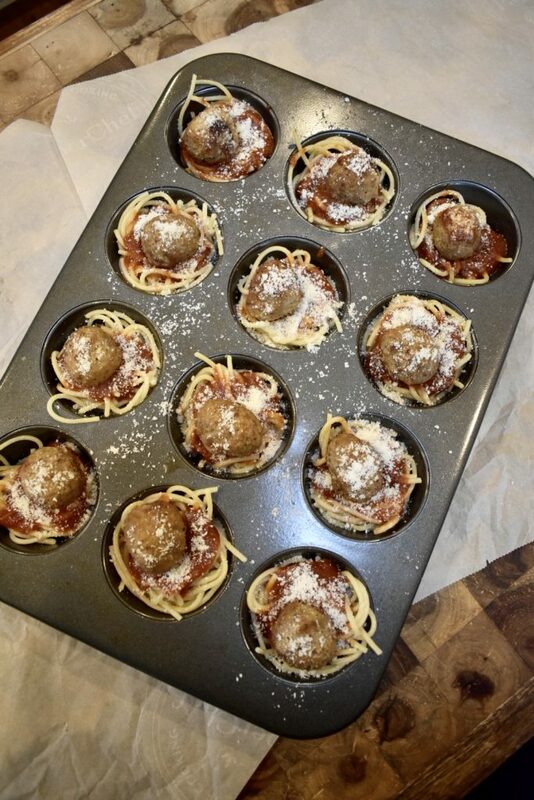 When cool, using a fork, twirl spaghetti into non-stick muffin pan cups, filling almost to the top. 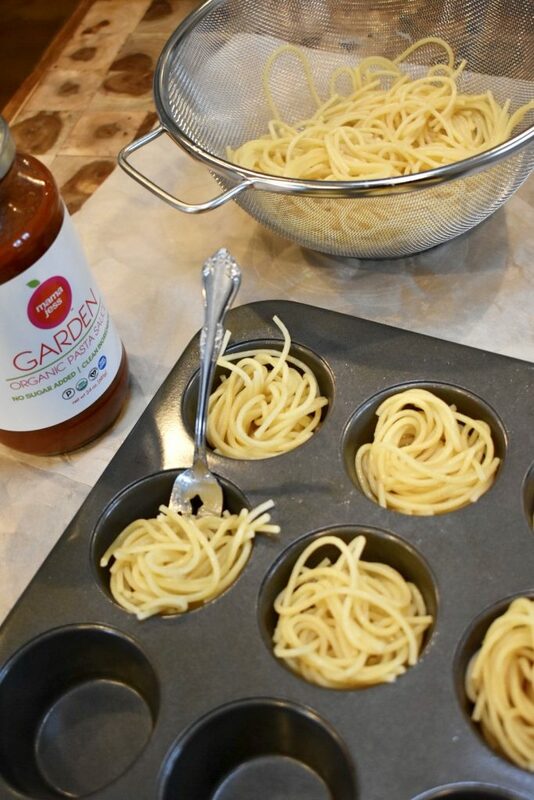 Amp the oven temperature up to 400 degrees F.
Spoon 2 tbsp of Mama Jess Garden Pasta sauce into each cup, spreading evenly on top of the noodles. Sprinkle parmesan cheese, salt, pepper, and basil on top of sauce. Add one meatball to each cup, nesting it inside the pasta and sauce swirl. Sprinkle more parmesan cheese on top of meatball, if desired. Bake for 15-20 minutes, or until spaghetti is crunchy on the sides and top.